We can hardly turn on the TV or pick up a magazine lately without being confronted by scare stories around ‘toxic sugar’. But what is the real story behind this sweet treat, and should you be worried? Thousands of people across Wales suffer from heart disease, diabetes, cancer, and obesity. Numbers are growing into an epidemic. Some people blame this directly on sugar, but it is more complicated than that. Too much sugar will cause weight gain. But too much of any calories will cause weight gain. Originally it was fat that was the target of dieticians and government advisors. We saw a huge rise in the consumption of low-fat foods. But what were these low-fat wonders packed with? Yes, sugar and sweeteners. Not surprisingly, they didn’t fix the problem. Some quite famous personalities are promoting ‘sugar-free’ lifestyles with radical changes to what you eat. They call sugar a ‘killer’ or a ‘drug’. As GP’s we would advise that these restricted diets are not good for your body. 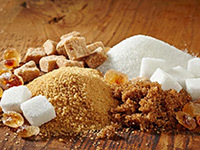 In fact, they are often replacing sugar with other things such as honey and maple syrup. All very yummy, and packed with useful micro-nutrients, but still sugar! The rather boring yet obvious solution is to choose a balanced diet, rich in fruit and veg. Sugar is found naturally in fruit and veg. If you eat these you’ll get your sweet treat, but you’ll also get a natural wonder packed with vitamins and minerals and fibre. Processed food and ready-meals are often full of sugar, so maybe get the whole family involved and get cooking at home? There is no need to turn down the odd sweet treat, but you’d be surprised how much even small changes to your lifestyle can help. Slow and steady. Your body will thank you for it! This year Britain introduces its ‘sugar tax’ and sugar-sweetened drinks will rise in price, so here’s a quiz for you! Did you know that children should consume no more than FIVE (5) teaspoons of sugar per day? (that’s from ALL food and drink). Adults should have no more than SEVEN (7) teaspoons. How many teaspoons of sugar in an average can of fizzy pop? Any guesses? Well, it’s NINE (9) teaspoons! Ouch!